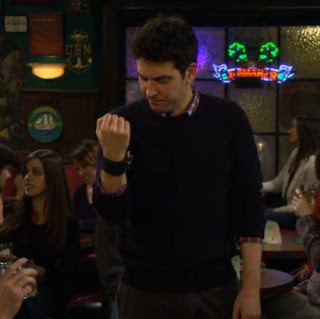 How I Met Your Mother "Ring Up" (S08E14): Ted saving an elderly woman from harm is nothing in comparison to the fact that he's dating a 20-year-old, Carly. [hitting on a salesgirl is one thing. buying her product is another. proceeding to get around Manhattan on rollerblades at all hours is another thing entirely...] Ted tries acting young, staying out late, ignoring the cold, and using hipster jargon, but once Carly mentions her admiration got his grey eyebrow hairs, he begins to feel bad. [haha at having five-year-olds dancing in the club!] The gang says that he should dump her, though Barney secretly demands that he stay with her so he can live vicariously. [haha!] Ted and Carly don't have anything in common with books, TV, or sports, but they can talk about Star Wars, albeit only the latest three films. [how is the fact that she can't legally drink not a bigger problem? also, bifocals and shuffleboard, hahaha!] However, tragedy strikes when Barney sees pictures of the girl - she's his half-sister! [whoa! glad that I saw no spoilers about that one!] He decides to stage a quickie wedding, but Ted helps Barney realize that he's actually over one-night-stands. That said, Ted is not beyond dating young girls, trying to use a hat to woo them. [odd, but still better than that cuff!